Keeping your home heated in winter can send your energy bills skyrocketing. There are plenty of tricks you can use to counteract this rise, such as installing a new thermostat, or replacing your air filter. Then there are more extreme measures. If you really want to heat your home more efficiently, while maintaining home comfort, you might consider radiant floor heating. But like any major decision, there are pros and cons. Heat rises. So it makes sense to put your heat source at the lowest possible point. A radiant floor heater is installed underneath your home’s floorboards, generating heat for your entire house. Traditional models do this by pumping warm water through a system of pipes beneath your feet, though there are now electric variants as well. One of the main benefits of this system is that it saves energy. A regular furnace must reach temperatures of up to 167 degrees just to make your house pleasantly warm. A floor heater, on the other hand, only needs to get up to about half that. On average, it can decrease your home’s energy bill by around 15 percent. Once installed, the heater doesn’t require regular maintenance, like a furnace does. And it can be connected to a programmable thermostat, just like any heating system, allowing you to choose when it goes on and off. There are two main drawbacks to a floor heater. The first is cost. Installation can be cost-prohibitive. While it’s true that you can recover those costs over time with savings to your energy bill, it can take years to reap the benefits fully. Plus, installation is a significant ordeal. All of your floorboards must be taken up and put back, taking a couple of days to complete. However, if you can schedule a time when the inconvenience will be minimal, and you think the savings will outweigh the cost, then a floor heater can be a great investment. 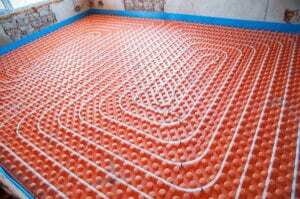 To learn more about radiant floor heating, contact us at Rinaldi’s Energy Solutions. We proudly serve Orlando’s HVAC needs.